If you want a mahogany runabout that replicates boats of yesteryear, but don’t want to pay the high price for a production rendition or restored antique, why not build it yourself? We ARE the source! We’ve got the BEST designs and the BEST selection. 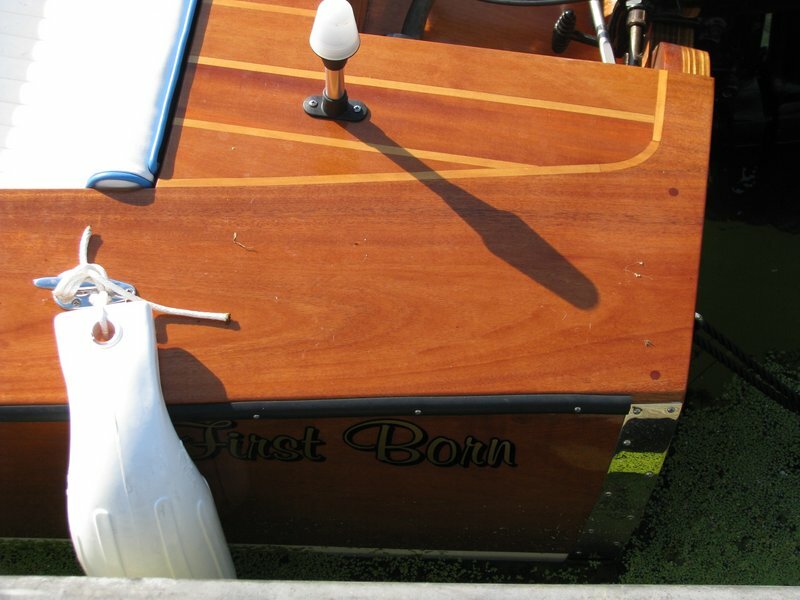 Our stock plans – all done under the discerning eye and experienced hand of our designers – feature TRUE AUTHENTIC STYLING that accurately emulates award-winning restorations you’ve seen at classic boat shows. And you’ll save a small fortune in the process, not to mention all the time and effort of restoring some questionable hulk that might cost more in the long run than building new from scratch. Even the most critical eye will be hard-pressed to tell the difference in our designs from classics of the past. Each features a shapely hull with reverse curved flaring topsides forward, tumblehome sterns aft, and a generous roll all along the deck edge. Our TAHOE models replicate those boats produced in the several years either side of 1940, while our BISCAYNE models capture the elegance of those produced around the 1950’s, with perhaps a hint of European influence and flair. Our BARRELBACK and KEY LARGO are as close as you’ll get to duplicating the famed Chris Craft Custom Runabouts built between 1939 and 1942 (less than 400 were ever built!). And there’s little difference between our MISS CHRIS and the long, shapely grand triple cockpit classics of the early 1930’s. If you are looking for more performance, we have a line of performance mahogany runabouts with the look of the classics, but with hull shapes designed for speed. The MONACO and RIVIERA are some of our most popular designs. 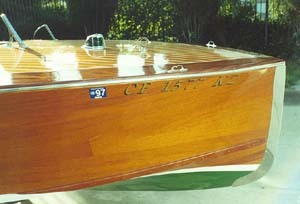 Mark Bronkalla (Riviera builder) calls his boat “55 mph furniture”. The GENTRY is our classic version of the perennial favorite, Cracker Box. MONTE CARLO is our performance option to MISS CHRIS. Whether you want the exact look of the originals or a performance version that most people will immediately assume is an original, Glen-L has what you are looking for. But most important, although we’ve designed these boats to be well within the realm of do-it-yourself builders with perhaps little or no boatbuilding experience, the resulting boats will actually be SUPERIOR to those of the past in virtually every way. It’s the result of today’s EPOXY TECHNOLOGY coupled with our proven building methods, leading to results you’ll be proud of. While our classic mahogany runabout designs capture the look and feel of past boats, they all feature modern, SIMPLIFIED CONSTRUCTION specially designed for today’s do-it-yourself woodworker. In fact, this construction is SUPERIOR to how such boats were built in the past. 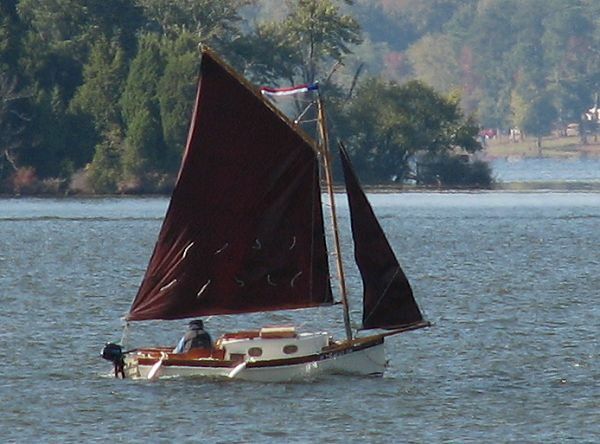 Unlike traditional boats often plagued by leaking seams and flexing hulls, these designs feature tight, stiff, strong, and lightweight COLD-MOLDED WOOD/EPOXY PLANKING. The epoxy seals and stabilizes the wood against moisture and locks out rot so that long life without excessive maintenance is assured. In fact, had such construction technology been available in the past, this is how boats would have been built. Our designs have no rabbets to cut, no members to steam, no seams to caulk, and no lofting from lines and offsets. Special skills and tools are not required. But only those who strive for quality craftsmanship should attempt such a project – these boats are not for slap-dash woodworkers. Planking consists of 1/8″ nominal thickness veneers of solid wood or plywood laid in double diagonal format. Bottoms have 4 layers, with 3 layers on the sides (5 and 4 respectively on MISS CHRIS), or other combination of thicknesses to a comparable total thickness. The final layer on the sides is typically run lengthwise and given a natural finish to emulate planking; only this layer need be mahogany or other grain type to suit. We recommend covering exterior hull surface with our FIBERGLASS COVERING KITS which are virtually transparent when complete in order to show the natural grain. 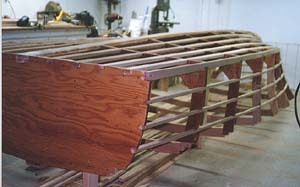 A UV-stable coating (such as varnish) is used for the final coat. Husky motor stringers also serve as jig members used to “key-in” the frames, and run nearly the length of the bottom. Closely spaced longitudinal battens support the planking over simple, sturdy sawn wood frames. All backbone member contours are taken from FULL SIZE PATTERNS. Plans include instructions, material listing, and resource list to obtain the specialty items used on such a project. Power comes from a gasoline direct drive motor located amidships; other powering systems are NOT recommended. We also recommend a contemporary powerplant over traditional types because they are lighter in weight, more compact, more reliable, and offer higher output for a given size. However, the replicas should not be over-powered; practical speeds should be limited to the 30’s and 40’s. 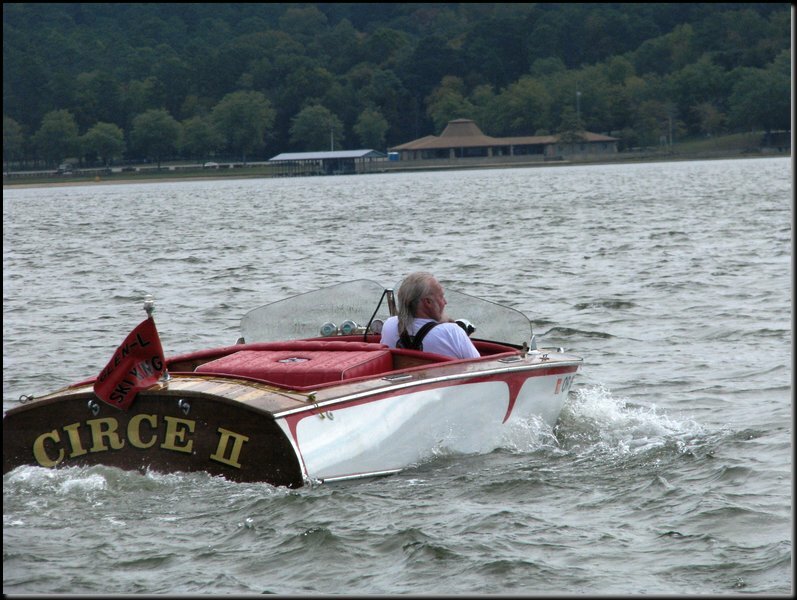 For performance choose one of our performance mahogany runabouts: RIVIERA, MONACO, GENTRY or MONTE CARLO. NOTE: Length options may be offered. This is done by respacing frames proportionately. These procedures are covered in the instructions, and the option comes automatically with the plans – no need to specify on your order. 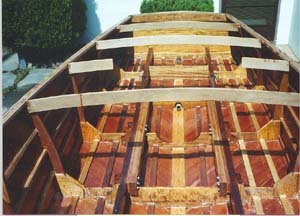 This series of photos of John Maddox building his BISCAYNE 18 in California shows the typical procedures used to build all of our CLASSIC MAHOGANY RUNABOUTS. 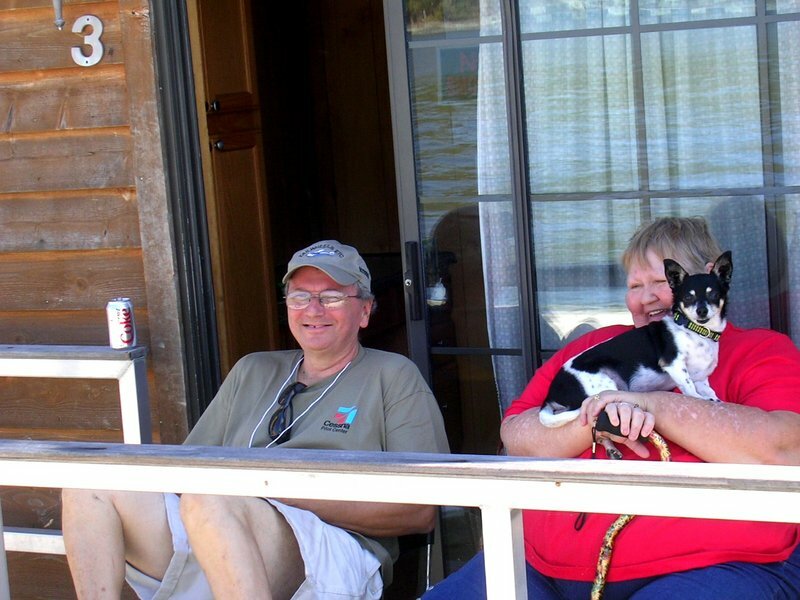 This was John’s first boat; he enjoyed the whole experience so much that he has started another – our TAHOE 23. Fig. 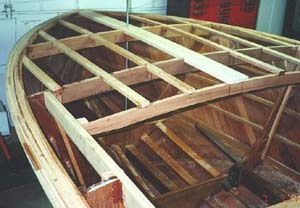 1 – Hull construction is done upside down over a simple building form or “jig”. 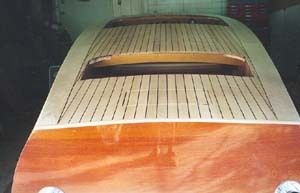 The top lengthwise members are the motor stringers that stay in the boat and are notched to receive the frames of the boat. Fig. 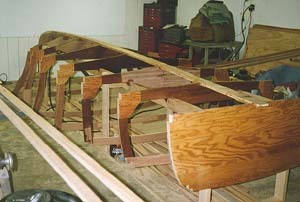 2 – Hull frame and backbone member contours are taken from FULL SIZE PATTERNS, built and set in place on the jig. Frames have been pre-coated with epoxy resin as part of our recommended EPOXY ENCAPSULATION system that locks out moisture to stabilize the wood, prevent rot, and eliminate maintenance. The same resin can also be used for gluing parts together. Fig. 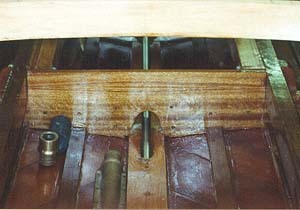 3 – Stringers (longitudinals) are notched into frames and wrapped around the hull to support and stiffen the planking, and provide backing at planking joints. Fig. 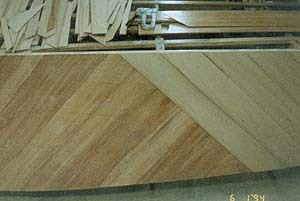 4 – Planking from thin plywood or wood veneers is cut into strips narrow enough to comply to framework contours and applied in double-diagonal format to the prescribed thickness. 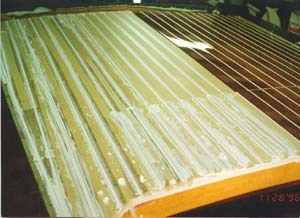 Epoxy resin is used for bonding throughout. Fastenings can be temporary types at this stage. Fig. 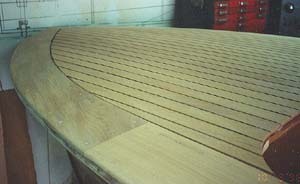 5 – Final planking layer is applied lengthwise to emulate traditional planking of the past. John did the bottom this way also, but double diagonal format here is optional as well. Hull is now ready for fiberglass cloth & epoxy sheathing as provided in our FIBERGLASS COVERING KITS. Fig. 6 – Completed hull has been removed from jig and righted for the balance of construction. John rigged up a dolly here, but you could also use the boat’s trailer at this point. 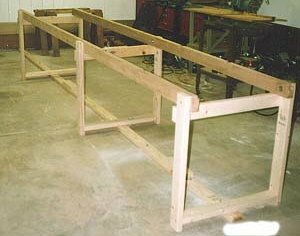 We have BOAT TRAILER PLANS that you can use to build your own. Fig. 7 – Hull is ready for the motor installation. Note husky stringers and adjoining motor beds bolted along the inside of these. Hull was bored for shaft while upside down. Note how all surfaces are coated with moisture-inhibiting epoxy. Fig. 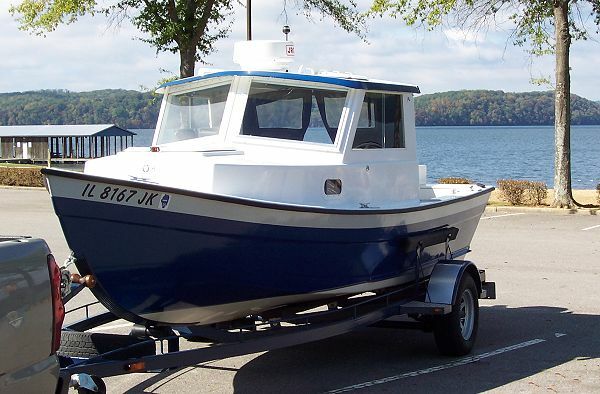 8 – John picked a new CRUSADER V-6 for his boat, a compact, lightweight motor with plenty of power. 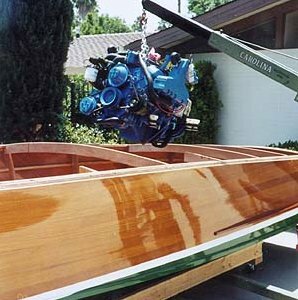 You could also convert your own automotive motor to marine use if you like. Fig. 9 – Motor has been installed along with the propeller shaft visible here. Hull is ready to be decked over now. Fig. 10 – Decking is supported by a strong framework. The vertical rod is for an optional lifting eye; another will be installed aft. Fig. 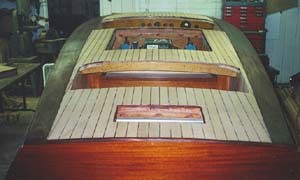 11 – Hull with plywood subdeck in place is ready for final deck. 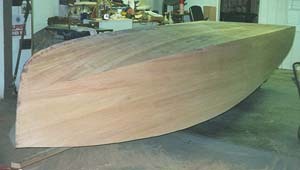 Note that the transom is not just a slab of flat plywood – plans include easy methods for making the authentic curved type without grief or hard work. Fig. 12 thru Fig. 15 (above & below) – Authentic decking appearance is done with mahogany ply or veneer overlaid on the plywood subdeck and bonded with epoxy glue. A builder can display a lot of creativity in this area with wood staining, seam caulking, hardware placement, etc. Fig. 15 Fig. 16 – What a gorgeous authentic bow! Looks just like the classics of the past, but without the headaches. 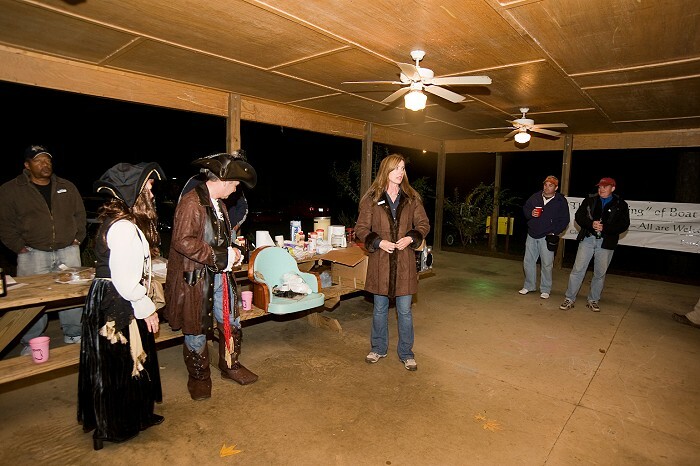 Plans include a resource list where you can locate authentic hardware and other specialty items. Fig. 17 – Interior outfitting and upholstery is another area where a builder can exercise self-expression as John has done here. Fig. 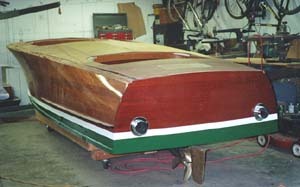 18 – Completed boat on trailer John custom-built for his boat makes heads turn wherever it goes. Fig. 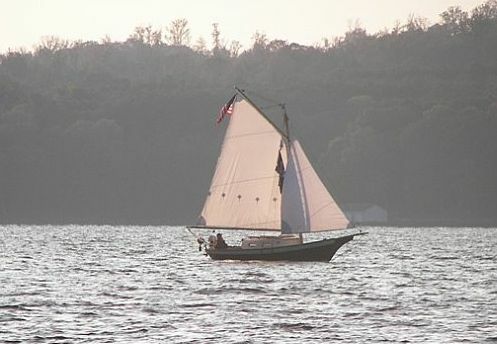 19 – On the water you’d swear John’s BISCAYNE 18 was an authentic classic restored at great expense. Instead, it’s a new boat that’s better in every way than any original and at a cost that was a fraction of a restored original. If you love working with wood, you can probably do it too!